In recent years, there has been intense research and considerable progress in solving numerous wireless sensor networking challenges. However, the key problem of enabling real-time quality-aware video streaming in large-scale multihop wireless networks of embedded devices is still open and largely unexplored. There are two key shortcomings in systems based on sending predictively encoded video through a layered wireless communication protocol stack, the encoder complexity and the low resiliency to channel errors. Compressed sensing is a new paradigm that allows the faithful recovery of signals from far fewer measurements than traditional methods based on Nyquist sampling. Hence, CS can offer an alternative to traditional video encoders by enabling imaging systems that sense and compress data simultaneously and much faster, at very low computational complexity for the encoder. 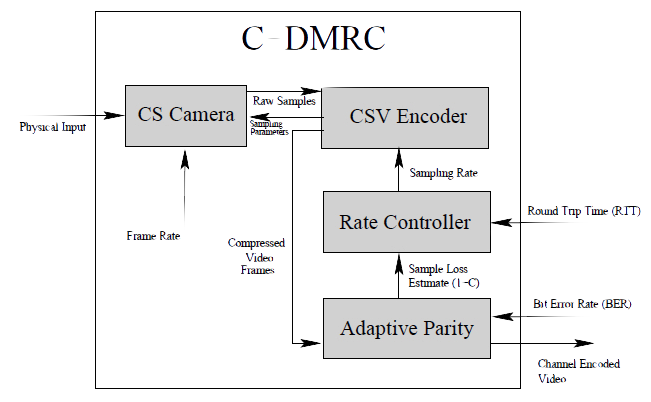 We developed the Compressive Distortion-Minimizing Rate Control (C-DMRC) system to take advantage of the distortion minimizing rate control (DMRC), adaptive parity and the CSV video encoded. 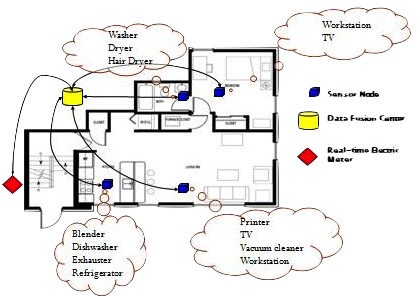 Monitoring of device level energy consumption in residential spaces is a challenging task. There are two approaches to achieve device level energy monitoring. One of them is to attach a power meter to each device in the household. Although this approach is able to provide fine-grained reports, it is not preferred due to its installation and maintenance cost. Other approach is based on measuring the total energy consumption of the household and using sophisticated statistical signature detection algorithms to estimate the device level energy consumptions. This approach suffers from the multi-state appliances that change their state over time. Thus, it can only provide coarse-grained energy consumption reports. We propose a new approach that is able to provide fine-grained device level energy consumption reports without the installation and maintenance complexity of existing solutions. We employ an audio sensor network to ease the installation process and reduce the cost of overall system. A multi-tier decision mechanism is designed to detect running devices. Sensor nodes try to identify the running devices based on audio data and only the result of identification is reported to the sink. If a sensor node fails to identify running devices, audio data is reported to the sink where a sophisticated identification is performed based on time and energy consumption. In this project, we study the cross layer design for video streaming over cooperative wireless multimedia sensor networks. The objective is to maximize the sum peak signal-to-noise ratio (PSNR) of multiple video sessions, by jointly regulating the video encoding rate at application layer, deciding the optimal relay selection strategy and controlling the transmission power for each source and relay node at lower layers. The research concentrates on at least three aspects: 1) Derive the upper bound for sum PSNR and study the interactions among video rate control, power allocation and relay selection. 2) Design distributive algorithms, which are implementable and has performance close to the optimum. 3) Implement and verify the algorithm using hardware, e.g., USRP2. 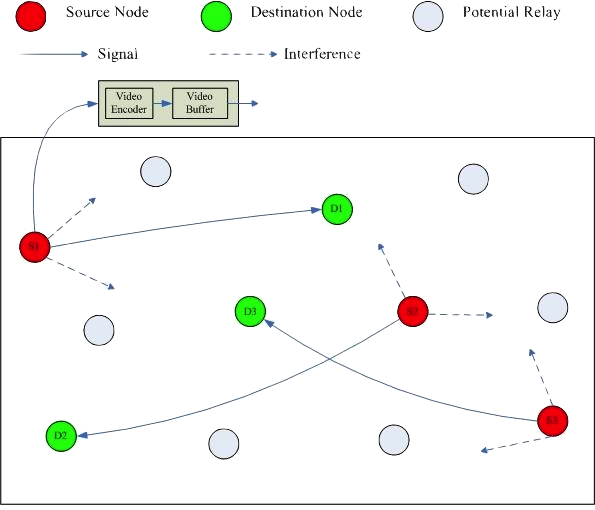 Extension of the research includes incorporating the mobility of nodes and routing, employing the game theory to study the fairness among multiple nodes. T. Melodia, W. Heinzelmann, "Cross-layer Optimization in Video Sensor Networks," IEEE COMSOC MMTC E-Letter, vol. 5, no. 3, May 2010.